Sarcodosis is a cruel, deceptive and callous friend. It is cruel because it takes a few years before it allows itself to be diagnosed and treated, but by then it has worked its way into the body, and continues to attack wherever it will. I have pains in my joints, particularly in my knees, yet there is no swelling or bruising. While I am burning under my feet, and feeling pins and needles at the end of my fingers and toes, family members and friends tell me I am looking will and cannot understand what is happening. It is deceptive because when I think I have little remission, it comes back when I least expect it, forcing me to cough and splutter my way through the day, grab hold of the handrails just when I feel like bouncing up the stairs, causing me to lose my balance as I am coming down the stairs or trying to walk in the dark, and occasionally causing embarrassing memory losses, particularly when it comes to the names of people I know well. It is callous because it attacks in the most callous ways. When they have ceased for a few months, the night sweats return. When I think the skin marks are receding, they burst out again. It is a friend … in ways. It is a friend because I realised later that all those tests were for lung cancer in the first place. But sarcoidosis has also given me a new attitude to life. It has forced me to find more time to get out in the open, to enjoy walks on the beach, by rivers and lakes and out in the countryside. In the past years those walks have been a bonus, for they help me to realise that while I may have sarcoidosis, sarcoidosis does not have me. During the past 12 months, I have had walks on the beach at Bull Island, Donabate, the beaches on Ireland’s Eye, at Loughshinny, Malahide, Portmarnock, Portrane, Robswall, Rush and Skerries, (Co Dublin); Killala and the beaches of Achill Island, including Dugort, Keel, Keem and Mweelin (Co Mayo); Bettystown, Laytown and Mornington (Co Meath); Enniscrone (Co Sligo); Rosslare (Co Wexford); Bray, Brittas Bay, Greystones and Kilcoole (Co Wicklow); and shoreline walks in Wexford, Howth and Dun Laoghaire. Outside Ireland, there were beach walks in Matala, Preveli, Rethymnon and the beach – the longest sandy beach on the island, in Spain at La Carihuela, once a fishing village on the edges of Torremolinos, outside Málaga, and along the coast to Benalmádena. In Greece, I had walks and swims at the beach in Rethymnon – the longest sandy beach in Crete – and at the beaches at Damnoni and Preveli. In Portugal, I never got to see the beaches west of Lisbon, but there were visits to the shore and the coast. In Ireland and England, I had lakeside walks in Enniskillen, Co Fermanagh, Blessington and Roundwood, Co Wicklow, and Virginia, Co Cavan, and river-side walks by the Slaney in Co Wexford, the Boyne in Co Meath and Co Louth, the Liffey in Dublin and Co Kildare, the Nore in Kilkenny, at the Meeting of the Waters in Avoca, Co Wicklow, and along the River Cam and the Backs in Cambridge. There were country walks in the Burren, Co Clare, Wicklow Mountains, walks in the Phoenix Park, by the field of daffodils between Gormanston and Julianstown in Co Meath, near Duleek in Co Meath, in the countryside in Hertfordshire and Essex, including Newport, Essex, near High Leigh in Hoddesdon, and walks in the countryside in Lichfield, especially along Cross in Hand Lane. I attended ordinations in Mullingar, Ferns and Dublin. And there was the roll-over Church History Road Tour that continued to Drogheda, Mellifont and Monasterboice, as well as visits to the monumental crosses at Balrath and Duleek, the ruins of Duleek Abbey, and the mediaeval churches in Stafford, Saint Mary’s and Saint Chad’s. In Dundela, Belfast, the Revd Lynn Gibson gave me a personalised tour of the church and rectory that inspired CS Lewis. It is a good idea too – not just in the battle with sarcoidosis but in enjoying new pleasures to life – to do something different and new on a regular basis. For the first time this year, I visited Ireland’s Eye off Howth (August), took a boat tour from Dun Laoghaire around the Dalkey Island (end of September), and visited the Cliffs of Moher (October). There were first-time visits too to the Botanic Gardens in Glasnevin, Farmeligh House, the Gardens at Mount Ussher, Co Wicklow, and the Lavender Farm in Kilmacanogue, Co Wicklow, and Charles Stewart Parnell’s house at Avondale in Rathdrum, Co Wicklow. .
As I travelled around Ireland during the year I stayed in Ballina, Co Mayo (January); Ballymena, Co Antrim (January), during talks with the Moravian Church; Rosslare, Co Wexford (February); Kilkenny, during the Dublin and Glendalough clergy conference; Enniskillen, Co Fermanagh (April), during a Holy Week mission in Saint Macartin’s Cathedral; a Dublin hotel during a residential board meeting of Us; Grey’s Guest House in Dugort, Achill Island, during the Heinrich Boll Summer School; on the shores of Lough Ramor, on the outskirts of Virginia, Co Cavan (May/June); and in Wexford (September). My mother and my mother-in-law died during the year. I also visited Millstreet, Co Cork, for an aunt’s funeral in May, attended the funeral of David Poole in the Quaker Meeting House in Rathfarnham in January, a funeral near Lisnaskea, Co Fermanagh, and took part in the funeral of Tommy Carr in Bride Street Church, Wexford, in October. I was in Wexford a few times during the year, staying in the Ferrycarrig Hotel after the ordination of the Revd Caroline Farrar in Saint Aidan’s Cathedral, Ferns, and went to church in Saint Iberius in February. I was in Kilkenny on many occasions, including the clergy conference in February and the Kilkenny Arts Festival in August. During the year, there was a number of visits to England too, including three visits to Lichfield and three to Cambridge. I was in Lichfield in February to complete my research and a portfolio of photographs for a lecture in May. That lecture in May was organised by Kate Gomez and the local history group, Lichfield Discovered. ‘Cathedral Close Stories’ was a walking tour of the Cathedral Close, Lichfield, and included social and architectural accounts of each house in the Close, including stories of scandal, snobbery and spite. I also attended the Holy Writ exhibition in Lichfield Cathedral during that visit. I was back in Lichfield again in June, after spending a day nearby in Penkridge, researching further details about the links between the Archbishops of Dublin and the Church of Saint Michael and All Angels. For centuries, Penkridge had been a “peculiar,” with the Archbishops of Dublin also holding office as Deans of Penkridge, which they kept outside the structures of the Diocese of Lichfield. That visit also provided an opportunity to visit two mediaeval churches in Stafford, Saint Michael’s and Saint Chad’s. During those visits, I stayed at the Hedgehog, which is welcoming inn on the northern edge of Lichfield, ideal for country walks, but just a short walk into the cathedral and the centre of Lichfield. There were three visits to Cambridge too. In June I took part in a seminar in Wescott House to celebrate the life and work of Metropolitan John Zizioulas of Pergamon. It also turned to a celebration of Archbishop Rowan Williams’s birthday. I was back in Cambridge later in June for a quick visit to Sidney Sussex College, and for some book-shopping. I was staying in High Leigh Conference Centre, near Hoddesdon, taking part in the annual conference of Us (the United Society, the mission agency formerly known as the United Society for the Propagation of the Gospel). Earlier that week, I spent a morning photographing in Newport in Essex, with timber-framed late mediaeval and Tudor buildings. I was back in Cambridge in September to take part once again in the annual summer school in Sidney Sussex College organised by the Institute for Orthodox Christian Studies. This year, the conference focussed on Russian philosophy and the mutual influences of Russian theology and philosophy in the 19th and 20th centuries. There was an opportunity there too to mark the 80th birthday of Metropolitan Kallistos Ware. Travel in Europe this year brought me to Spain, Gibraltar, Switzerland, Greece, Germany and, for the first time, Portugal. I spent the Easter weekend in Spain, experiencing the Spanish traditions of celebrating Easter. I stayed in the Roc Lago Rojo Hotel in La Carihuela, once a fishing village on the edges of Torremolinos, outside Málaga. During that extended weekend, I also visited the white-washed mountain-side village of Mijas, the Picasso house, the Cathedral and the Amphitheatre in Malaga, Granada and Alhambra, walked along the coast as far as Benalmádena. That weekend also provided an opportunity to spend a day in Gibraltar, one of the most unique and isolated places I have visited, almost as unique as my experiences of Albania or Namibia. I had a cup of coffee in Zurich on my way to Greece for a week at the end of August. I have lost count of the number of times I have stayed in Crete, and this year I stayed in the Hotel Brascos in the centre of Rethymnon. There the roof garden provided panoramic views over the old town with its Turkish minarets, Byzantine towers and Venetian fortezza, and out across to the harbour. I visited “Homage to the Greek,” an art exhibition in the Fortezza marking the 400th anniversary of the death of El Greco, and “Ghosts of the Mediterranean, or The Reflections of the Past,” a video installation by Marianna Strapatsaki in the Kara Mousa Pasa Mosque in the Old Town. I also visited the Kourtaliotiko Gorge, the Minoan site at Phaistos, the Monastery of Aghia Irini in the mountains above Rethymnon, the Monastery of Saint John in Preveli, the white beach at Damnoni, and the beach at Preveli, where I took the “Ice Bucket” challenge in aid of MND research. There was time for dinner with friends, and an evening on an old sail boat sailing in the waters near Rethymnon. On the way back from Greece, I stopped for a few hours in Frankfurt … time enough to have dinner before continuing on to Dublin. In November, I was in Lisbon for a special anniversary. We stayed in the Hotel Real Palácio in the heart of Lisbon, and visited the castle, the cathedral, numerous churches, the monastery at Belém, with the cloisters and the church of the Mosteiro dos Jerónimos, the Padrão dos Descobrimentos, with its monument to the Discoveries, facing out to the sea, the Torre de Belém. We went sailing on the River Tagus, and took the ferry to Porto Brandão, which in the darkness looked like a charming fishing village with a tiny beach, and had dinner there before returning to Lisbon. We also visited the Cabo da Roca, the westernmost point of the Iberian Peninsula and of continental Europe, and there were all-too-short visits to Sintra, Cascais and Estoril. I continue to write a monthly column for the Church Review (Dublin and Glendalough) and the Diocesan Magazine (Cashel, Ferns and Ossory), and to write for the Lichfield Gazette, The Irish Times, the Church of Ireland Gazette, and Koinonia, as well as other publications. In the Church Review and the Diocesan Magazine in January, I told the story of Fenton Hort, an important Cambridge theologian and Biblical scholar who was born in Leopardtown, Co Dublin. In February, I asked what links the Bridge of Sighs in Venice with similar bridges in Oxford, Cambridge and Dublin. In March, I examined the dialogue between the Moravian Church and the Church of Ireland, and the story of the Moravians in Ireland. In April, I marked the 1,000th anniversary of the Battle of Clontarf, fought on Good Friday 1014. In May, I wrote about Sir Thomas Myles, the surgeon who masterminded the Kilcoole gunrunning in 1914. In June, I recalled my Easter experiences in Spain. In July, I looked at the centenary of the outbreak of World War I. In August, I wrote about my visit to the mediaeval churches in Stafford. In September, I asked what questions the Scottish referendum raised about English identity. In October, I took a look at Gibraltar. In November, I offered a review of Zorba the Greek 50 years after the movie was made, in the light of my visit to Crete during the summer. In December, I asked whether there is an appropriate Anglican way of speaking of Mary at Christmas. In the midst of the crisis facing the besieged Yazidi minority in Iraq, I wrote a half-page feature on their beliefs and origins for The Irish Times. It received wide notices, including one in the Huffington Post, and I was interviewed about it on Pat Kenny’s show on Newstalk. I wrote throughout the year for the Lichfield Gazette. In January/February, I told the story of Richard Lovell Edgeworth, a Lichfeld eccentric who gave his name to Edgeworthstown in Co Longford. In March, I wrote about the musician Muzio Clementi, the Revd Henry Gylby Lonsdale, Vicar of Saint Mary’s, Dr Charles Holland, and Henry Gastineau, an artist, who lived in Lyncroft House, now the Hedgehog in Lichfield. In May, I told a story that brought two great Victorian architects, Pugin and Potter, to Lichfield. In October: stories of scandal, snobbery and spite in the Cathedral Close. In May, I contributed a paper to Koinonia on the poet John Betjeman as an Anglo-Catholic, marking the thirtieth anniversary of his death. 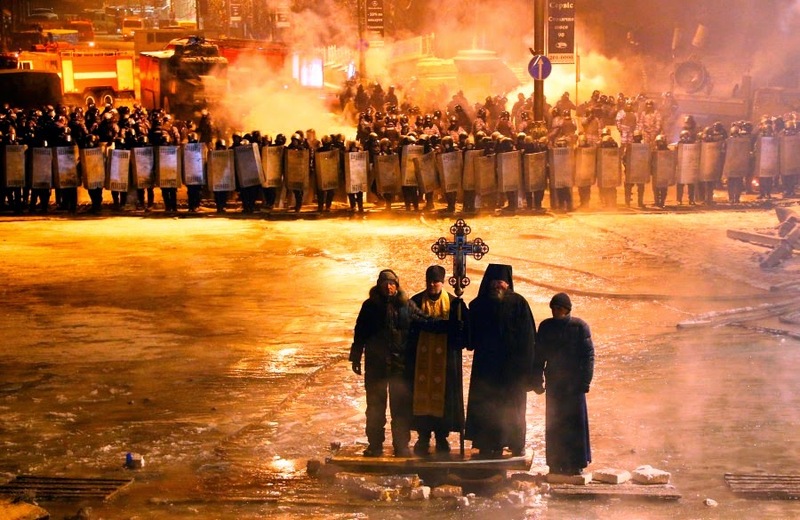 My contributions to the Church of Ireland Gazette included reports from the General Synod, and a feature on the churches in Ukraine and their role in the street protests before the collapse of the former government. I wrote on Kempe’s carvings on the triptych in the Lady Chapel for the Spring Edition of Three Spires and Friends of Lichfield Cathedral, 77th Annual Report, 2014. A photograph I took at the Blessington Lakes was used on the Late, Late Show on RTÉ, a photograph of Stowe Pool in Lichfield was used on BBC Midlands in March, and another photograph was used in a fundraising brochure for Jesus College Boat Club, Cambridge. I took part in Joe Duffy’s Spirit Level and was interviewed by Pat Kenny on the plight of the Yazidis in northern Iraq. The television programmes I took part in with Dervla Kirwan and spoke about Saint Patrick continue to be rebroadcast regularly at surprising times in a variety of countries. There were book launches in Lichfield Cathedral, for Paul Spicer’s new biography of the composer Sir George Dyson; Christ Church Cathedral, Dublin, for a new and comprehensive biography, Donald Caird: Church of Ireland Bishop: Gaelic Churchman: A Life, by Aonghus Dwane; Saint Mary’s College, Rathmines, for Father Paddy Ryan’s new study of Archbishop Miler Magrath. And I was invited to launch a new history of the Moravian Cemetery in Whitechurch. I have written three contributions to books that are due to be published next year . But earlier this year Dr Michael Ryan, former Director of the Chester Beatty Library, made kind mention of my two chapters in Treasures of Irish Christianity, edited by Professor Salvador Ryan and Bishop Brendan Leahy, in a book review in The Irish Times. In May, I spoke at the Heinrich Boll Summer School in Achill on the Achill Mission’s work in Mweelin. I spoke on Sir Thomas Myles in Kilcoole during the centenary commemorations of the Kilcoole gunrunning. Later in the year, I talked on the World War I and 1916 commemorations to the men’s group in Saint Ann’s Parish. As well as preaching in the of the Chapel Church of Ireland Theological Institute and Christ Church Cathedral, I also preached in All Saints’ Church, Grangegorman, Saint Bartholomew’s Church, Ballsbridge, Saint Michan’s Church, Church Street, Saint Werburgh’s Church, Dublin, and Zion Church, Rathgar. One sermon in Christ Church Cathedral referred to the crisis in Gaza and the Israeli war crimes that lead to the murder and death of thousands of children, women and innocent civilians. Of course, the sermon attracted strong criticism from the Israeli ambassador after it received strong news coverage in The Irish Times, but he never returned my telephone call to his embassy. I was in Christ Church Cathedral to welcome the Bikers on a Mission, who were touring every Church of Ireland cathedral to raise funds for Us work in Swaziland, and helped to organise the service in Saint Patrick’s Cathedral marking the tercentenary of the presence of Us (USPG/SPG) in Ireland. In the days before Christmas, I also helped with the Black Santa Appeal outside Saint Ann’s Church, Dawson Street. This appeal has now passed €35,000, more than last year’s total exceeding all expectations for this year. All the money raised goes directly to local charities, mainly those working with homeless people on the streets of Dublin. I was involved with the Liturgical Advisory Committee in preparing a Service of the Word for use on Remembrance Sunday. I have been re-elected to the General Synod of the Church of Ireland and the Board of Christ Church Cathedral, and I remain a member of the Commission for Christian Unity and Dialogue, the Anglican Affairs Working Group, and councils and boards of Us in Ireland and Northern Ireland, and Us in Britain. As President of Irish CND, I spoke at the annual Hiroshima Day commemorations in Merrion Square and took part in the launch of the Irish Anti-War Movement’s pamphlet on the commemorations of World War I, with extensive reporting on television and in The Irish Times and the Irish Independent. I contributed to the World War I exhibition in the north transept of Saint Patrick’s Cathedral, Dublin, I was a special guest at the unveiling by President Higgins and the Duke of Kent of the Commonwealth War Graves Commission Cross in Glasnevin Cemetery, and also attended the D-Day commemorations in Penkridge. I missed my usual visit during the Cambridge summer school to Saint John’s Monastery in Tolleshunt Knights, which often acts like an annual retreat. But I visited the monasteries of Aghia Irini and Preveli in Crete and spent Ash Wednesday in the Manresa Retreat Centre. My blogging this year included themes blogs on Art for Lent, Hymns for Advent, and Carols and Hymns for Christmas, and this blog has now had over 1.8 million individual hits. I continue to work as Lecturer in Anglicanism, Liturgy and Church History in the Church of Ireland Theological Institute, as an Adjunct Assistant Professor in Theology in the University of Dublin (Trinity College Dublin) and as the Visiting Lecturer in Anglicanism at Mater Dei Institute of Education, which is a college of Dublin City University. I continue to find my genealogical research brings contacts with cousins, near and distant, that I have never met before. But it was surprising to find that the house in Beechwood Avenue where my great-grandfather, James Comerford, died in 1902, was on the market at the same time as two former Comberford family homes, Comberford Hall and the Moat House, were also on sale. The major international stories this year are being summarised in many newspapers and on countless television programmes. They include the appalling invasion of Gaza by Israel and the murder of innocent children, women and civilians, with the widespread destruction of homes, businesses and infrastructure; the rise of Isis in the Middle East, with its attacks on Christians, Yazidis, and Shia Muslims; the civil war in Syria; the war in Ukraine and Crimea; missing planes and planes shot down; the Scottish referendum; the Ebola crisis; the riots in Ferguson; the rise of the far-right across Europe; the economic collapse of Greece; … the list goes on. For some people the World Cup and the Irish rugby triumphs may have been the good sports stories this year. But at home there were water charges protests, and there the plight of the homeless on our streets which has been crying out for attention for years received new focus with the death of a homelessness man in Molesworth Street, near Dail Eireann. But the most be bewildering news of the year must of the rise of Sinn Fein in the opinion polls despite the drip-drip account of how they helped child-abusers and women-beaters to move around freely. Although Mairia Cahill is giving graphic accounts of how this is systemic within Sinn Fein, party activists whipped up an hysteric cry of “Gerry, Gerry Gerry” from the crowd when the Sinn Fein President made a cameo appearance at a water charges protest outside Leinster House. Bewildering indeed. It is interesting and ironic how Sinn Fein is mirroring Ukip in Britain, grounding its appeal on populist issues while continuing to push an ultra-nationalist agenda. What will next year bring as Ireland faces a general election that may determine how the 1916 centenary is commemorated? Meanwhile, next year for me is going to be another year of living with sarcoidosis … but while I may have sarcoidosis, sarcoidosis with not have me.